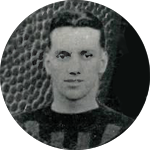 Stinchcomb was one of three former Ohio State University football stars [see also Chic Harley and Tarzan Taylor] to play for the Staleys in 1921. Although he signed with Halas in Chicago on August 15, Pete was late in arriving in Decatur at the start of the season due to his marriage to Anne Jane Summers of Columbus on September 20, 1921. Thus he only played in 11 of the 12 games that year at both quarterback and halfback. He scored 4 touch downs that season including 50 and 11- yard TD runs in a win against Jim Thorpe’s Cleveland Tigers at Cubs Park on November 20, and a 45-yard TD run in a victory against Curly Lambeau and the Packers the following Sunday in Green Bay. In addition to his football exploits at OSU, in his senior year Pete founded the Student Bookstore in Columbus; won his varsity letter on the basketball team; and on June 18, 1921 won the NCAA long jump championship in Chicago with a leap of 23 feet, 3 and a half inches. After the 1921 season with the Decatur/Chicago Staleys he joined the Chicago Bears in 1922 and played all 12 games on both offense [3 TDs] and defense. In 1923 he stayed in Ohio and played in seven NFL games for the Columbus Tigers and one game for the Cleveland Indians. After playing some independent league football and amateur basketball while working he played in at least three NFL games in 1926 for the Louisville Colonels and lost his last pro game against Halas and the Bears on November 7, 1926 at the now-named Wrigley Field. In the off-season, family man Pete often worked in construction and sales. On August 17, 1922 he got the contract to lay out the new gridiron at his Alma Mater. Today “Stinchcomb Drive” is located to the north of “Harley Drive” in the “University Village” area of Columbus. In 1935 he also served briefly as the assistant backfield coach for Buckeyes football. In the 1950s he was owner and president of Rae Columbus, Inc. Later he moved to Findlay, Ohio and served as president of Linworth Homes and of the Eagle Creek Utility Company. He passed away at Blanchard Valley Hospital at age 78 on August 24, 1973 after a brief illness. He had just been elected to the College Football Hall of Fame but died before his induction ceremony. His HOF biography explains that “Although a lightweight at 165 pounds, Stinchcomb was a halfback blitz, quick and shifty as he made his way through enemy defenses.” “G.R. Pete Stinchcomb” now rests at Union Cemetery in Columbus.